During World War II, thousands of Native Americans took part in the crusade for the defence of freedom and democracy in all theatres of operation: from Normandy to the Pacific via Africa and North Italy, the soldiers from these tribes demonstrated huge patriotism and courage. During World War II, thousands of Native Americans took part in the crusade for the defence of freedom and democracy in all theatres of operation: from Normandy to the Pacific via Africa and North Italy, the soldiers from these tribes demonstrated huge patriotism and courage. No minority has contributed as much to, or been as largely influenced by, World War II. 44,000 Indians in a population of 400,000 have served under the flags of the US military, with five receiving the Congressional Medal of Honor. Many other soldiers of Indian origin, such as Gregory"Pappy" Boyington, the famous commander of the "hotheads" and Ira Hayes, one of the Marines who hoisted the American flag on Mount Su-Ribash at Iwo Jima, have also known glory. The soldiers that fought in the ranks of the Allies came from many tribes of North America, such as the Navajo, the Apaches, Sioux, Cheyenne, Comanche, Choktaws, Mesk-wakis, Cherokees and other Iroquois, and many specialised in transmissions and using their languages​as secret code on the Pacific theatre. 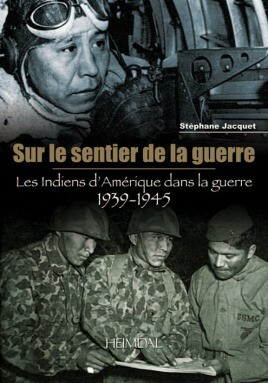 Based on many photos, maps and testimonials, the author presents the decisive and often unrecognised contribution of the Indians of North America to the war effort. The US and Canada pay tribute to the soldiers of the First Nations Canadian and American who sacrificed their youth for their country.